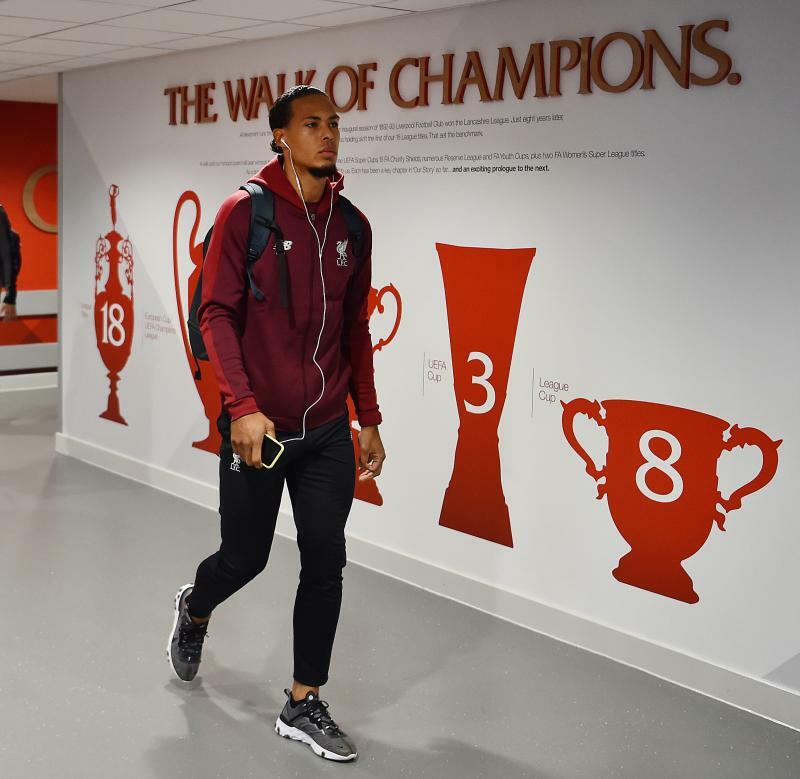 Follow all the build-up, action, reaction and much more as Liverpool take on Paris Saint-Germain in the Champions League at Anfield. 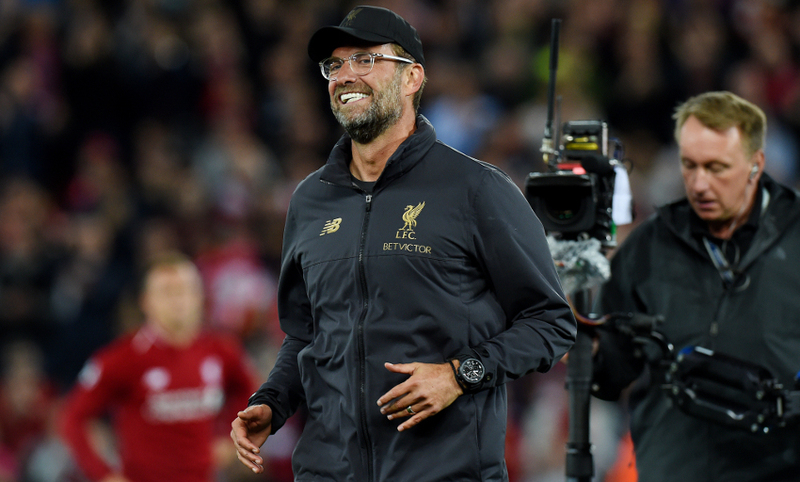 Jürgen Klopp offered his verdict and Liverpool's performance and the result after the 3-2 win over Paris Saint-Germain tonight. He also spoke about Daniel Sturridge's excellent performance and Roberto Firmino's impact after coming off the bench. No player has been involved in more goals than Roberto Firmino in the Champions League since 2017/18 (18 - 11 goals, 7 assists). Liverpool get their Champions League campaign off to a winning start in the most dramatic of circumstances. 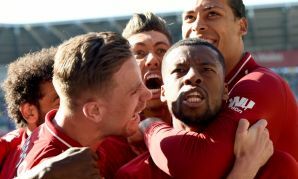 A flying start from the Reds saw them race into a two-goal lead courtesy of Daniel Sturridge's header and a James Milner penalty; ,however, Thomas Meunier pulled one back for the French champions before the break. 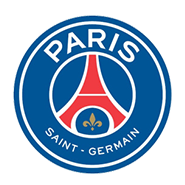 The hosts dominanted the second period, but PSG levelled with their first shot on goal after the break as Kylian Mbappe swept in. But, having come off the bench, Roberto Firmino won it in stoppage-time when he drilled home the winner. Liverpool have the lead once again in stoppage-time! Firmino collects a cleared corner, dances his way into the box and drills low into the far corner. Alexander-Arnold's free-kick clips the PSG wall and the outside of the post. Unlucky! Shaqiri comes on for the Reds in place of Salah. The visitors hit the Reds with a sucker punch as Mbappe rasps home from 12 yards. Mane evades a challenge from Kimpembe inside the box with a cheeky dink before whizzing an effort inches wide. 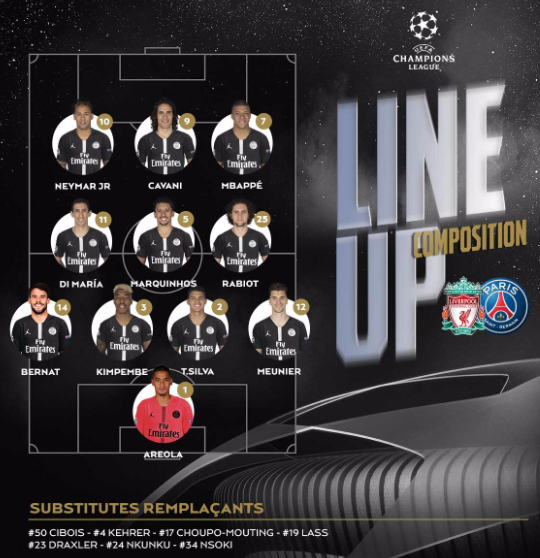 Double change for PSG - Draxler and Choupo-Moting on, Cavani and Di Maria off. Van Dijk heads back across the area from an Alexander-Arnold cross, but Salah can only scoop wide under pressure. 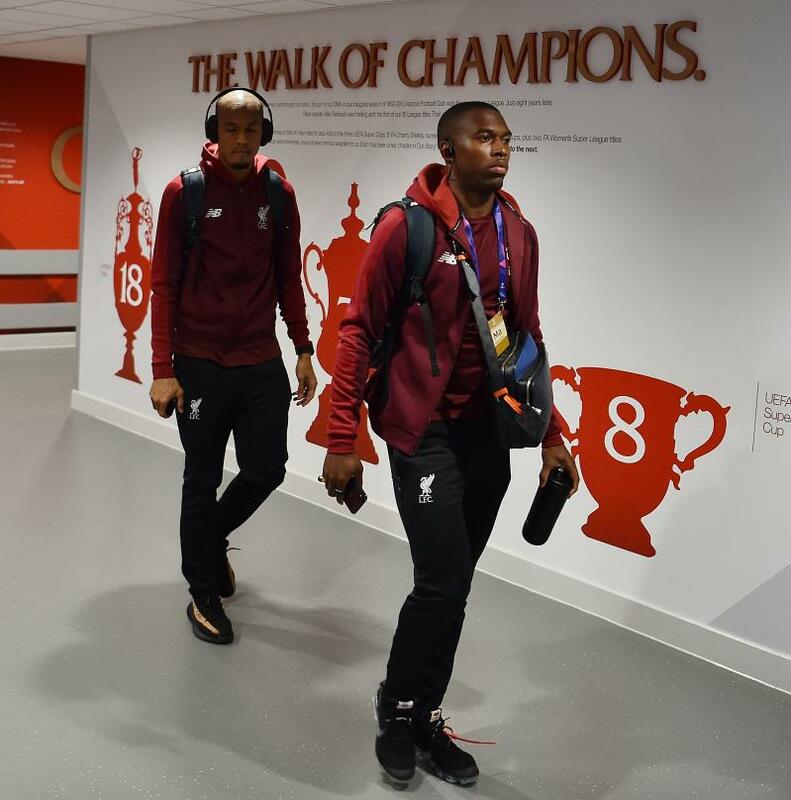 Liverpool make the game's first change and Daniel Sturridge makes way for Roberto Firmino. An excellent display from the No.15 upon his return to the starting XI, capped with a fine goal. A nicely worked free-kick routine releases Alexander-Arnold into space inside the box behind the PSG wall, but his cross can't find a teammate in the six-yard area and the visitors clear. Sturridge tries to find the top corner from the left corner of the area; however, it's too high. 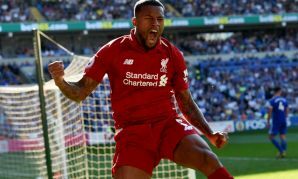 A brilliant cross from the right pick out the head of Sturridge, but the striker can't repeat his first-half effort as he can't connect properly and it bounces into the thankful grasp of Areola. 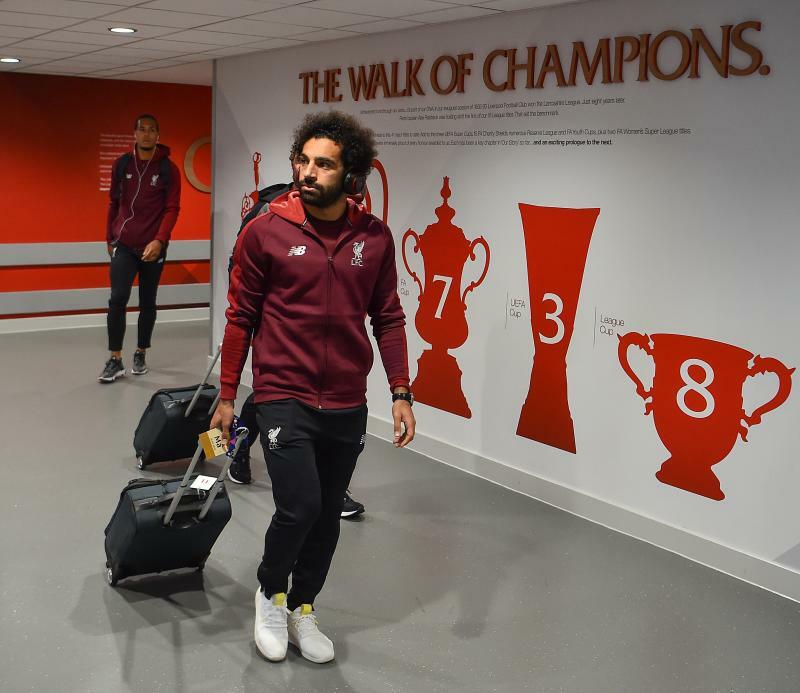 Mohamed Salah has the ball in the net after a scramble inside the six-yard box, but it's ruled out after Sturridge is deemed to have fouled Areola in trying to win possession. Lovely ball over the top from Sturridge almost finds Salah's dart into the centre, but Areola is off his line to collect. PSG re-start the game at Anfield. 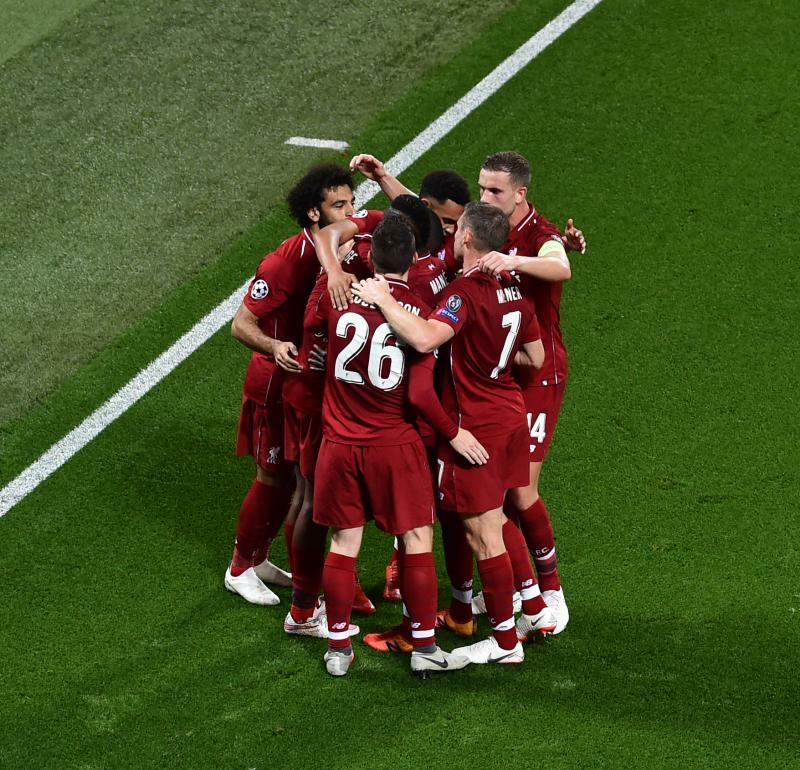 Since the start of last season, Liverpool have scored 43 Champions League goals; 10 more than any other team in the competition in this period. I think that's what you call a breathless half of football. 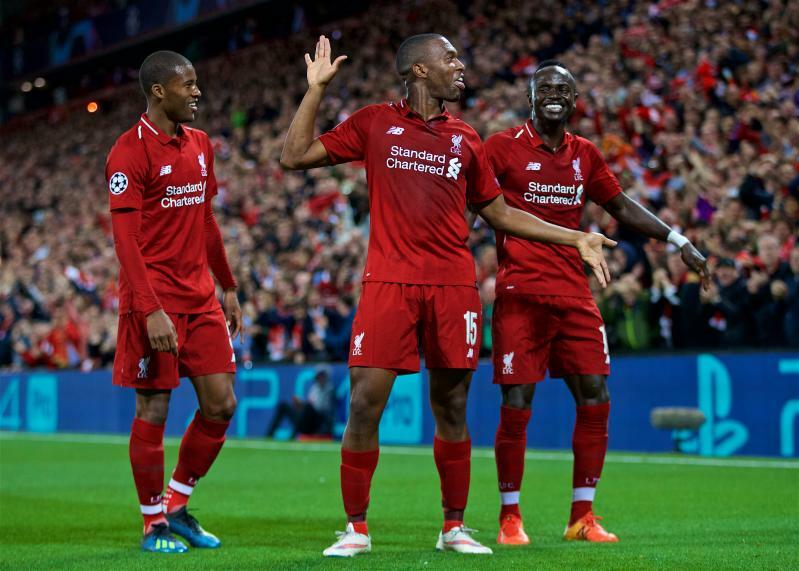 Liverpool hold an advantage over PSG at the break thanks to a dominant first-half display, which was rewarded by goals from Daniel Sturridge and James Milner (penalty). But Thomas Meunier's strike just before half-time has reduced arrears at the half-way stage. Meunier now sees yellow for a foul on Mane. The full-back reacts to clip a half-volley into the bottom corner after the ball had bounced up off Robertson. No mistake from the vice-skipper! Wijnaldum is tripped by Bernat and the Reds have a spot-kick! Neymar crashes a 25-yard free-kick into the Liverpool wall. Almost a second as Salah, Mane and Wijnaldum cause havoc inside the PSG box, but the visitors eventually clear. Liverpool have the lead they deserve for the way they've started this game - and it comes from the head of Daniel Sturridge. Alexander-Arnold's cross is retrieved by Robertson, who swings it straight back into the middle where our No.15 plants it beyond Areola with his forehead. Anfield erupts and the wriggly arms dance is on show. 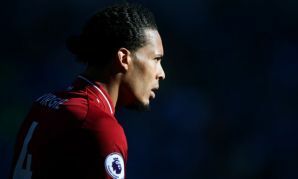 Virgil van Dijk goes into the book having been adjudged to have pulled back Mbappe. 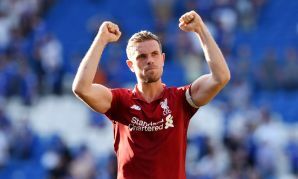 Henderson feeds an over-hit corner to Mane down the right, who jinks beyond Neymar and into the area but strikes well wide of the far post with his left boot. Di Maria tries his luck from range, but he doesn't connect properly and it's another easy claim for Alisson. Milner's pass almost puts Mane clear through on goal, but Silva recovers to cut out the danger. PSG fashion their first chance as Neymar steps into space inside the box and blasts goalwards, but Alisson is equal to it - and the 'keeper collects Cavani's scuffed rebound. 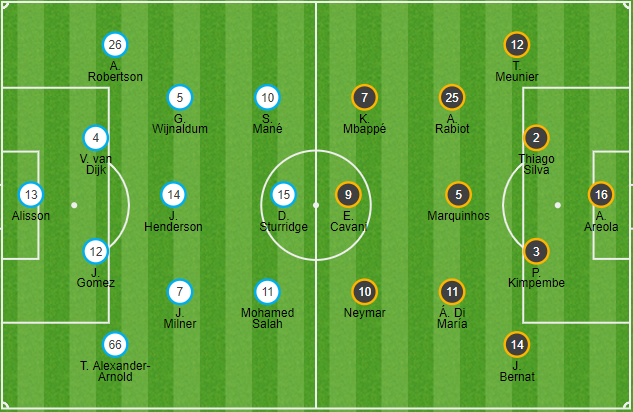 Gomez stoops to meet Salah's outswinging corner from the left, but can only direct his header over the crossbar. Now Mane stings the palms of the PSG 'keeper with a blast from the edge of the box. Salah's corner almost goes straight in, but Areola scrambles it over. Liverpool are well on top here. A good spell of pressure from the hosts. Now Areola needs to push Milner's low left-foot drive around the base of the post. 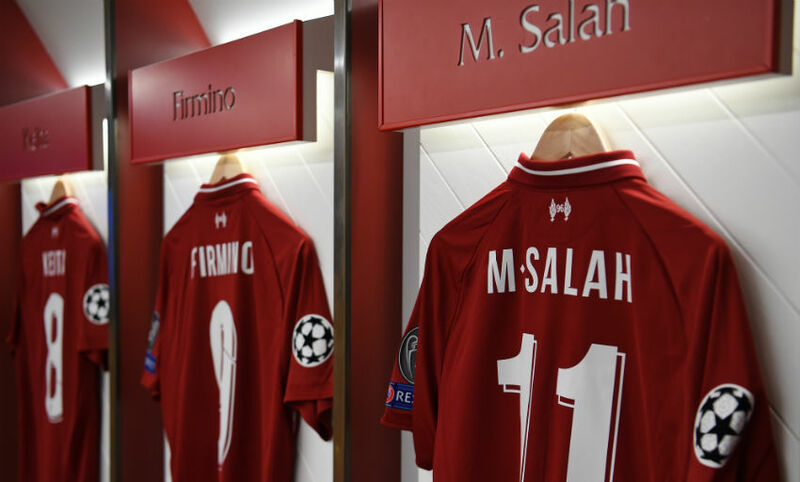 Liverpool catch PSG sleeping with a short corner routine as Salah plays it back to Milner. His driven cross finds its way to Van Dijk, whose half-volley crashes into the turf and needs Areola to push it over the bar. An even start here at Anfield, but Liverpool win the game's first corner and the noise levels go up several decibels. James Milner starts the game and Liverpool are attacking the Kop in the first half. 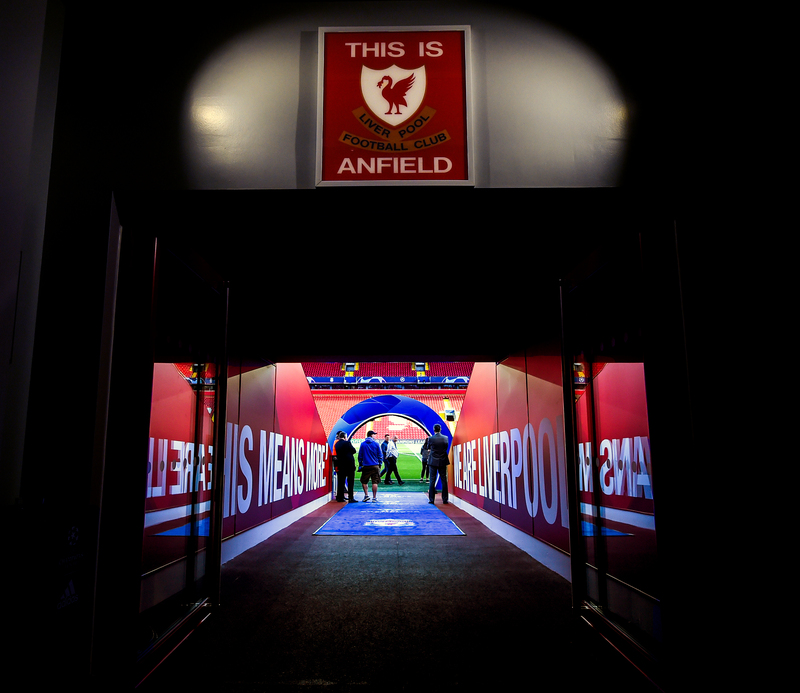 What an atmosphere we have inside Anfield. Incredible. You'll Never Walk Alone is booming around the stadium. How will the two sides line up? 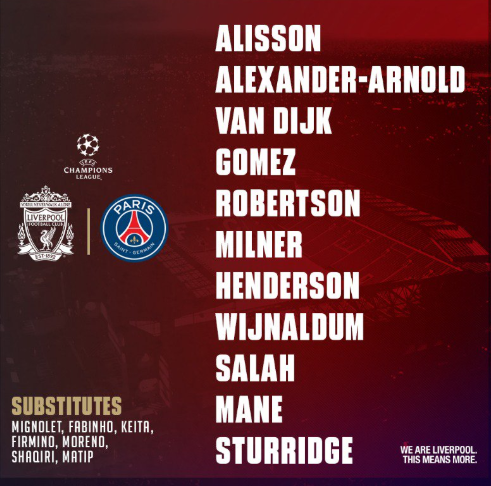 There are two changes for Liverpool against Paris Saint-Germain as Jordan Henderson and Daniel Sturridge come into the starting line-up. 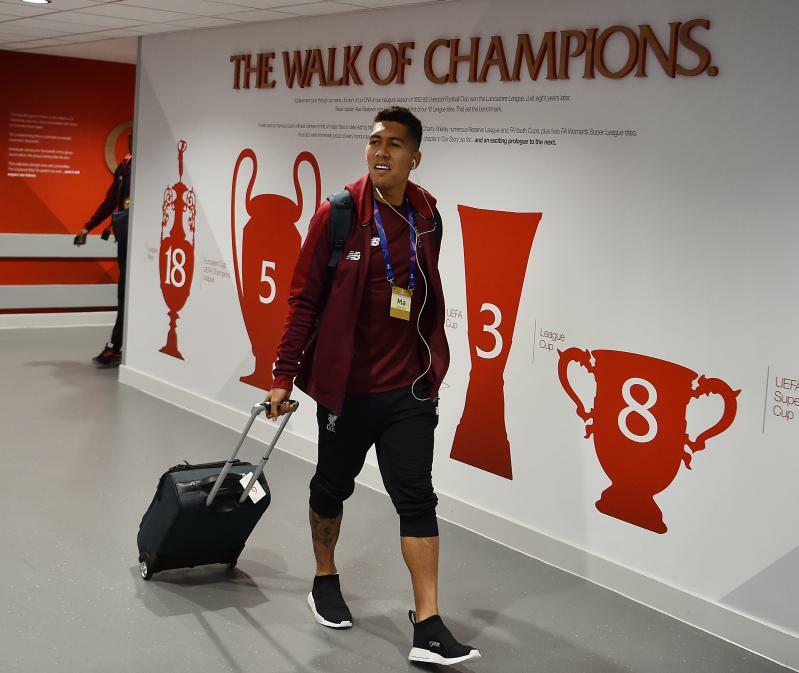 Roberto Firmino is named on the bench after sustaining an eye injury at Spurs on Saturday, while Naby Keita is also among the substitutes. 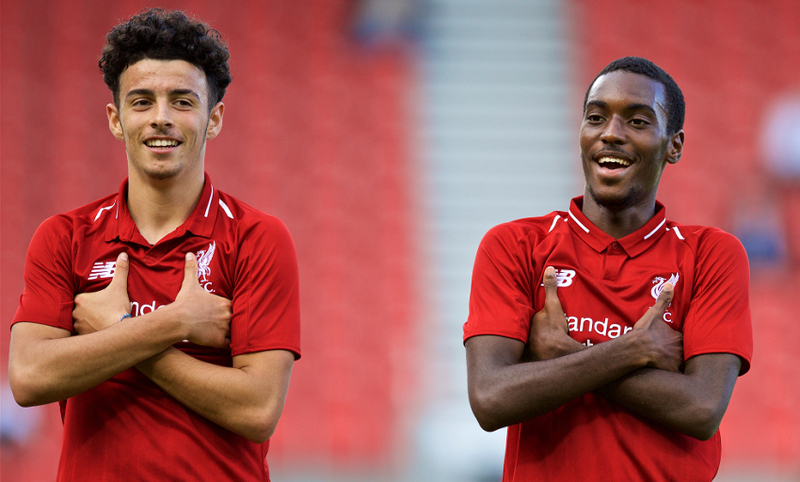 There's one win in the bag for Liverpool over PSG already today... the U19s have just completed a 5-2 victory against the French side in the UEFA Youth League. Read our summary of a fantastic start to Group C for the young Reds here. 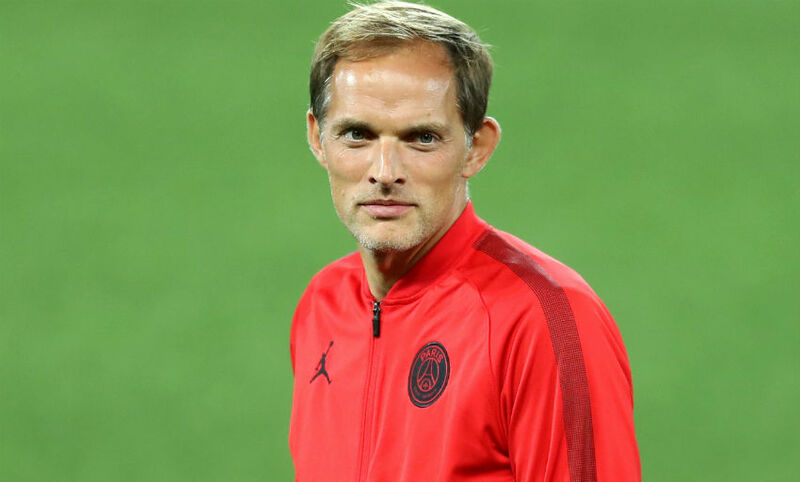 Paris Saint-Germain boss Thomas Tuchel held a press conference after arriving on Merseyside on Monday - and he was full of respect for Liverpool and the power of Anfield. 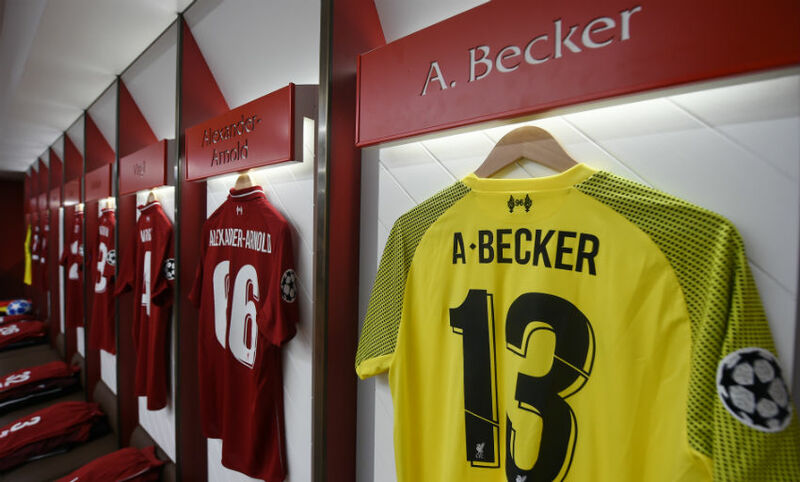 Tuchel was, of course, in the opposite dugout when the Reds overcame Borussia Dortmund in unforgettable fashion in L4 in the Europa League back in 2016. 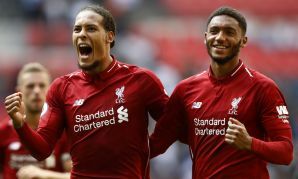 "Playing at Anfield is special," said the German on Monday. "My players know that - we know that we cannot switch off. I experienced the atmosphere during a legendary evening here with Dortmund. "You can never be comfortable at Anfield, even when you have the ball. They are comfortable without it. You will never have a moment of quiet or calm against Jürgen's teams, no chance. The players know that, but I will tell them that." 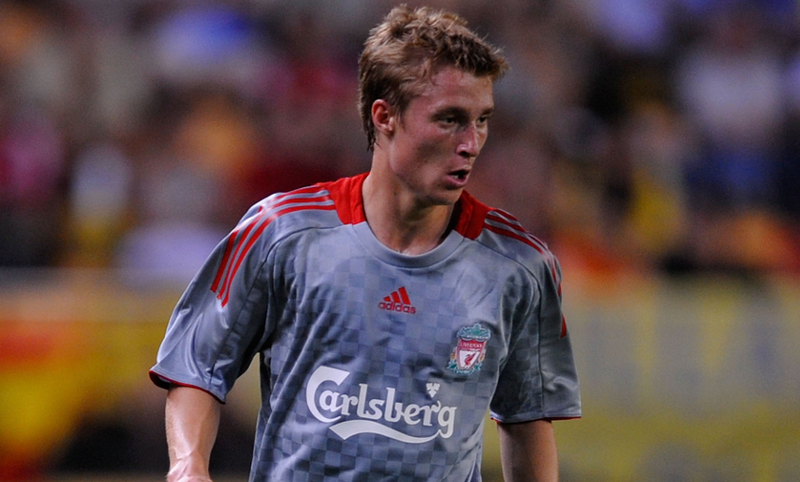 Liverpool Football Club are saddened by the news former defender Stephen Darby has today announced his retirement from football at the age of 29 after being diagnosed with motor neurone disease. 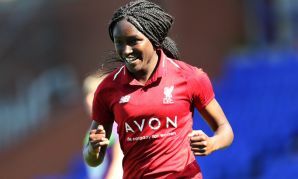 The popular Reds Academy graduate made six appearances for the first team between 2008-2010 and was part of the club’s FA Youth Cup winning teams in 2006 and 2007. Darby made the announcement via Bolton Wanderers’ official website on Tuesday morning, for whom his last appearance came in December after joining them in 2017. After leaving Liverpool in 2012 on a permanent basis, he spent six years with Bradford City making more than 200 appearances. 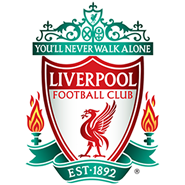 The thoughts of everyone at Liverpool Football Club are with Stephen and his family at this time and we will be offering our support to them. Liverpool will need to check on Roberto Firmino's fitness ahead of the game after he sustained an eye injury against Tottenham on Saturday. Divock Origi and Dominic Solanke are set to miss out after picking up minor knocks while representing the U23s against Swansea on Saturday, while Adam Lallana and Dejan Lovren remain sidelined. PSG are without Italian duo Gianluigi Buffon and Marco Verratti due to suspension, but Kylian Mbappe and Neymar return after sitting out the home win over Saint-Etienne at the weekend. 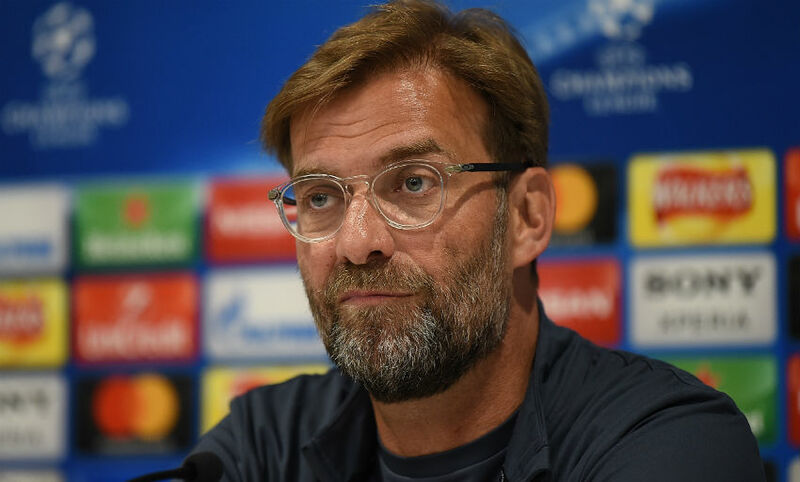 Ahead of tonight's game, Jürgen Klopp sat down with Liverpoolfc.com to exclusively give us his thoughts on the clash with Paris Saint-Germain. And he explained why Saturday's 2-1 win at Tottenham Hotspur was the 'perfect preparation' for this evening's encounter with Thomas Tuchel's men. “It was the perfect preparation actually for the game against PSG because I think similar things will be needed in that game. We need to be really ready to defend them well when they ask us because wow, what a strong side they are. You should avoid too many situations in and around our box because there is the biggest quality of them." Read our chat with Klopp in full by clicking here. 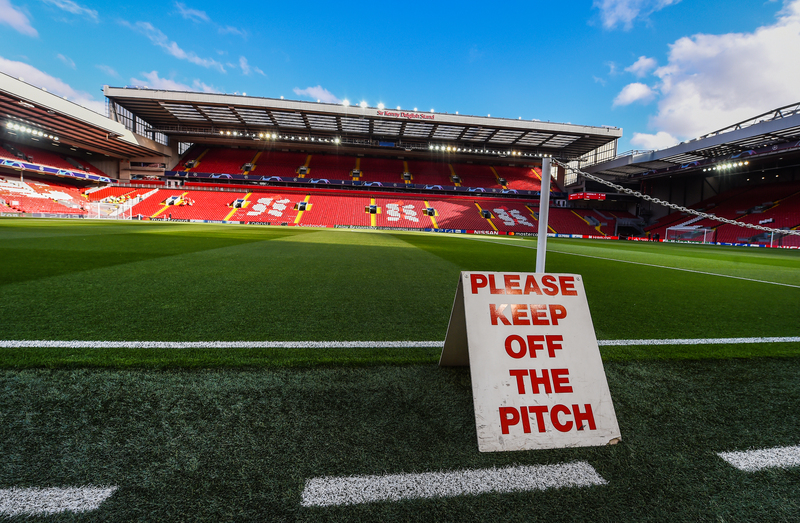 Some news away from tonight's game and Liverpool Football Club has today been granted temporary planning permission to host music concerts and major events at Anfield for the next two years. 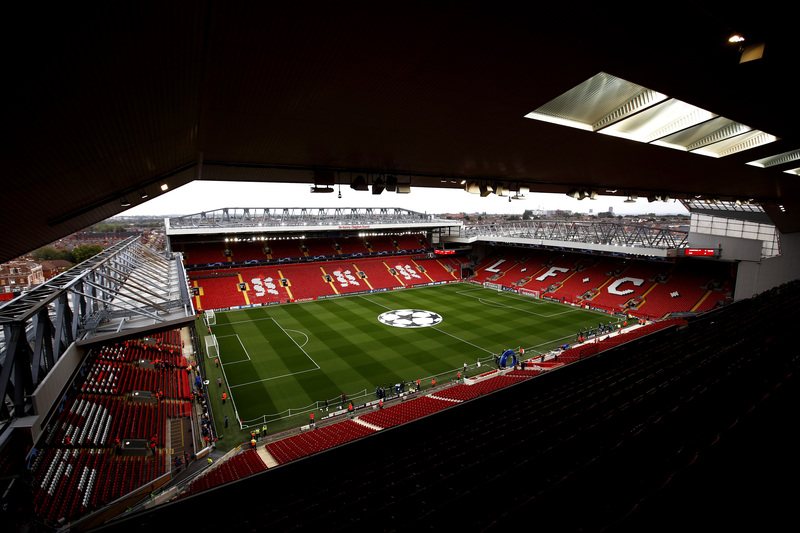 As part of the plans, LFC can host up to six events per year, which are expected to take place from May 2019. 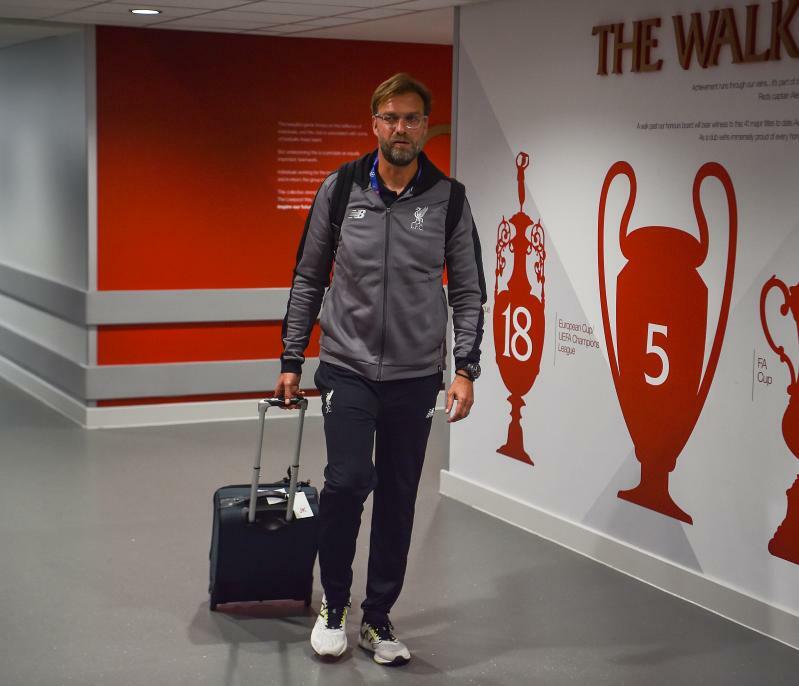 ...were scored by Liverpool in 15 matches in the Champions League last season, including the two-legged qualifier with Hoffenheim. We've picked out five of the best, which you can enjoy in our video below. 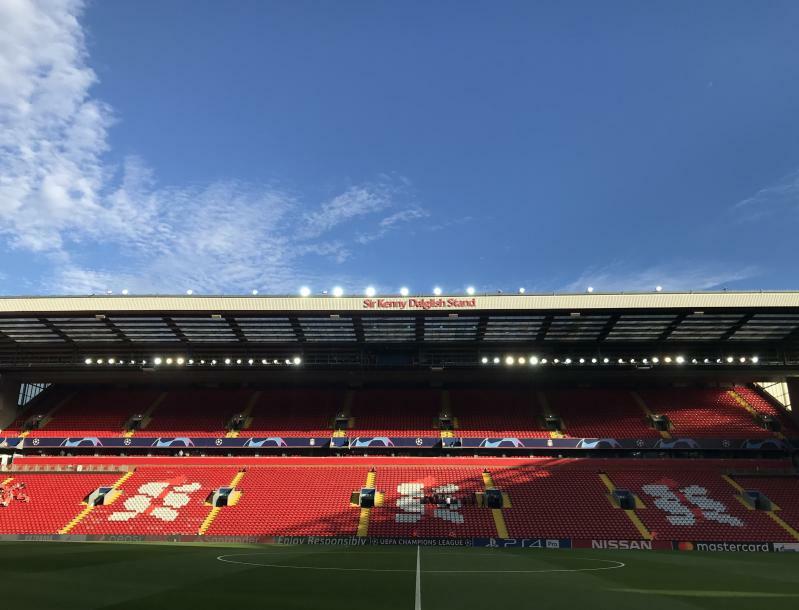 Tonight's match broadcaster in the UK, BT Sport, went behind the scenes of a busy day on Merseyside as Liverpool and Paris Saint-Germain conducted their pre-match media duties ahead of the game. The first edition of the 'No Filter UCL' series of the new season can be watched in the YouTube video below. Paris Saint-Germain paid their respects to the victims of the Hillsborough tragedy after arriving in Liverpool on Monday evening. 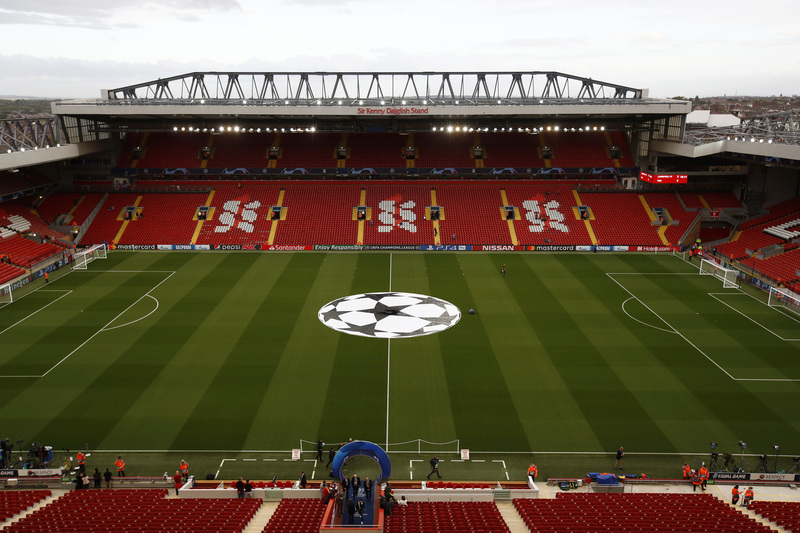 The French club are on Merseyside to face the Reds in the opening game of the Champions League group stage – the teams’ first competitive meeting in 21 years. 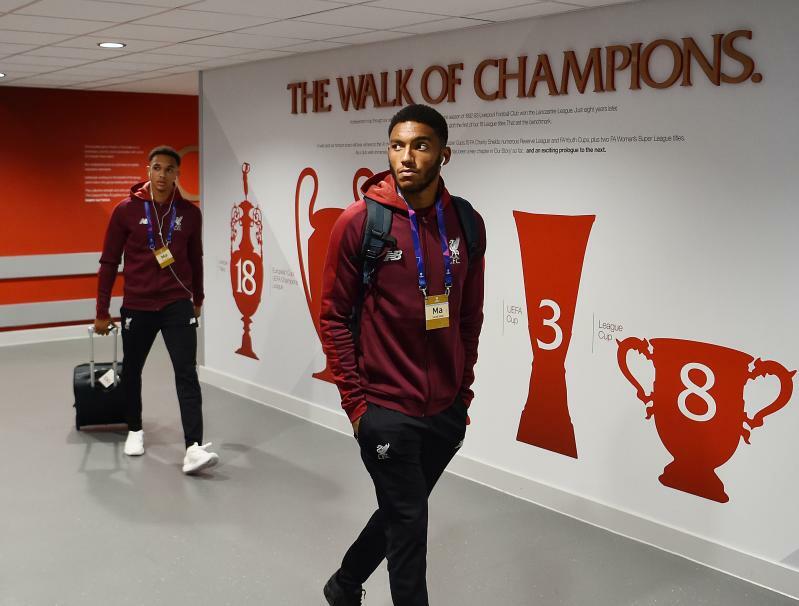 Ahead of Tuesday’s match at Anfield, PSG president Nasser Al-Khelaifi laid flowers at the stadium’s permanent memorial to the 96 supporters who lost their lives as a result of the events on April 15, 1989. 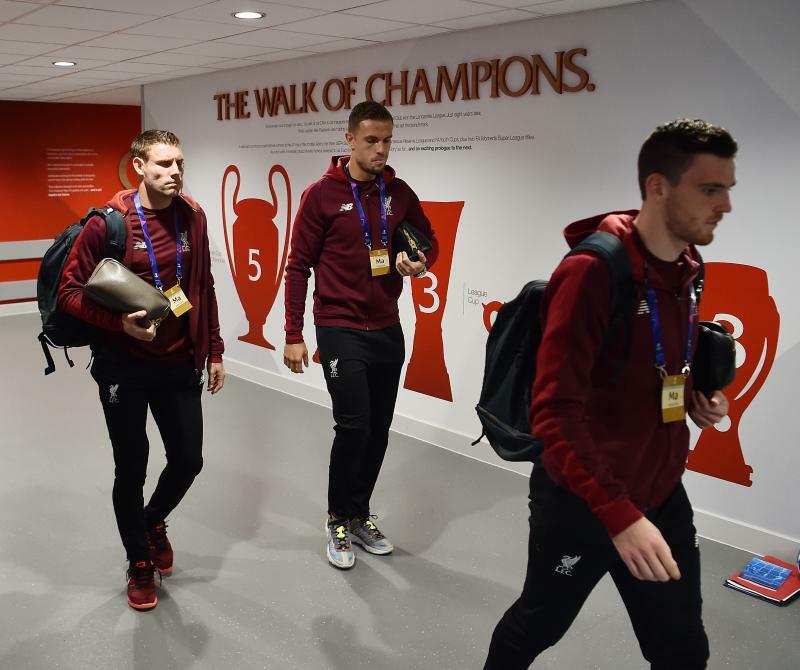 Jürgen Klopp and Jordan Henderson faced the world's media inside a packed out Anfield media room on Monday afternoon. You can watch their pre-match press conference below. ...if this doesn't get you going even more ahead of tonight's game, nothing will. Pick up your copy of 'This is Anfield' at the stadium tonight, or online here. 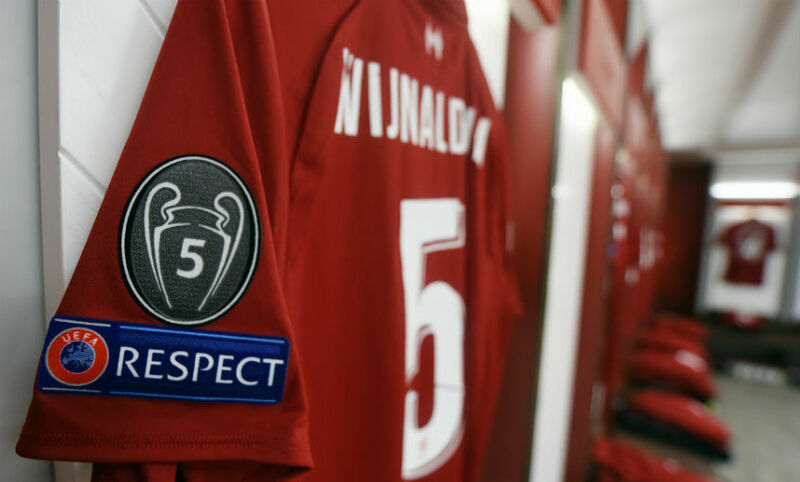 ...and welcome to Liverpoolfc.com's live matchday blog as the Reds prepare to kick off their Champions League campaign with an Anfield clash against Paris Saint-Germain tonight. 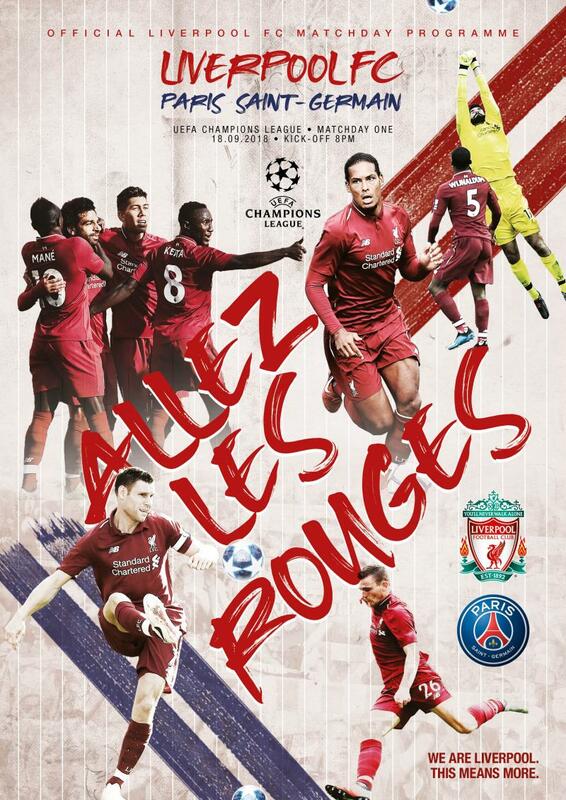 It was some ride in Europe last season as we reached the final, with some epic nights in L4 along the way - and all the ingredients are there for another occasion to savour as we tackle the French champions. 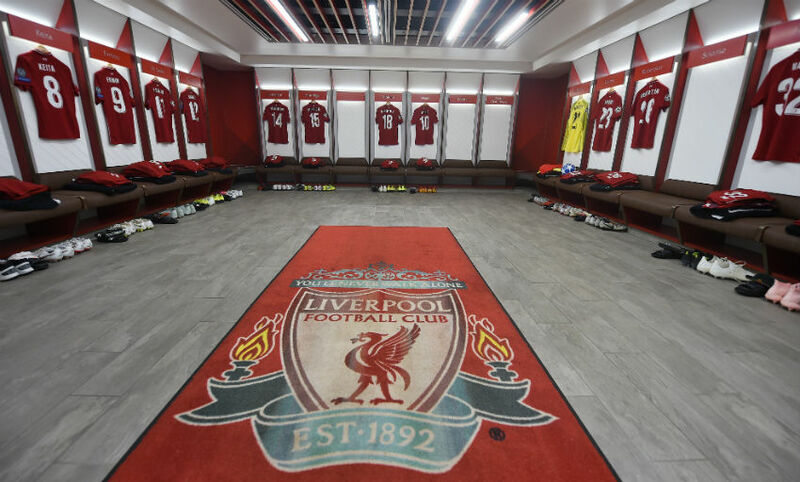 Stick with us throughout the day as we bring you all the build-up before we confirm the team news, bring you minute-by-minute updates of the action and, finally, the post-match reaction from Anfield. Oh, and of course, there'll be a weather update or two along the way.